Monoterpenes are a class of terpenes that consist of two isoprene units and have the molecular formula C10H16. Monoterpenes may be linear (acyclic) or contain rings. Modified terpenes, such as those containing oxygen functionality or missing a methyl group, are called monoterpenoids. Monoterpenes and monoterpenoids are diverse. They have relevance to the pharmaceutical, cosmetic, agricultural, and food industries. Monoterpenes are derived biosynthetically from units of isopentenyl pyrophosphate, which is formed from acetyl-CoA via the intermediacy of mevalonic acid in the HMG-CoA reductase pathway. An alternative, unrelated biosynthesis pathway of IPP is known in some bacterial groups and the plastids of plants, the so-called MEP-(2-methyl-D-erythritol-4-phosphate) pathway, which is initiated from C5 sugars. In both pathways, IPP is isomerized to DMAPP by the enzyme isopentenyl pyrophosphate isomerase. Isopentenyl pyrophosphate (IPP) and dimethylallyl pyrophosphate (DMAPP) condense to produce geranyl pyrophosphate, precursor to all terpenes and terpenoids. Geranyl pyrophosphate is the precursor to monoterpenes (and hence monoterpenoids). Biosynthesis is mediated by terpene synthase. 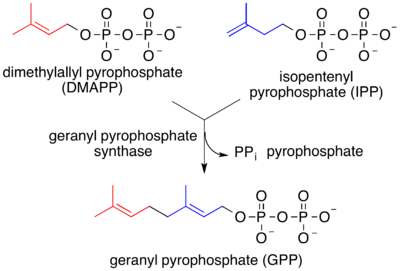 Elimination of the pyrophosphate group from geranyl pyrophosphate leads to the formation of acyclic monoterpenes such as ocimene and the myrcenes. Hydrolysis of the phosphate groups leads to the prototypical acyclic monoterpenoid geraniol. Additional rearrangements and oxidations provide compounds such as citral, citronellal, citronellol, linalool, and many others. Many monoterpenes found in marine organisms are halogenated, such as halomon. menthol, a monoterpenoid, not a true terpene. In addition to linear attachments, the isoprene units can make connections to form rings. The most common ring size in monoterpenes is a six-membered ring. A classic example is the cyclization of geranyl pyrophosphate to form limonene. The terpinenes, phellandrenes, and terpinolene are formed similarly. Hydroxylation of any of these compounds followed by dehydration can lead to the aromatic p-cymene. Important terpenoids derived from monocyclic terpenes are menthol, thymol, carvacrol and many others. Geranyl pyrophosphate can also undergo two sequential cyclization reactions to form bicyclic monoterpenes, such as pinene which is the primary constituent of pine resin. Other bicyclic monoterpenes include carene, sabinene, camphene, and thujene. Camphor, borneol and eucalyptol are examples of bicyclic monoterpenoids containing ketone, alcohol, and ether functional groups, respectively. Monoterpenes are emitted by forests and form aerosols that are proposed to serve as cloud condensation nuclei (CCN). Such aerosols can increase the brightness of clouds and cool the climate. Several monoterpenes derivatives have antibacterial activity, such as linalool. Others are used as flavors, such as menthol. ^ Eberhard Breitmaier (2006). "Hemi‐ and Monoterpenes". Terpenes: Flavors, Fragrances, Pharmaca, Pheromones. doi:10.1002/9783527609949.ch2. ^ Kumari, I.; Ahmed, M.; Akhter, Y. (2017). "Evolution of catalytic microenvironment governs substrate and product diversity in trichodiene synthase and other terpene fold enzymes". Biochimie. 144: 9. doi:10.1016/j.biochi.2017.10.003. PMID 29017925. ^ Pazouki, L.; Niinemets, Ü. (2016). "Multi-Substrate Terpene Synthases: Their Occurrence and Physiological Significance". Frontiers in Plant Science. 7: 1019. doi:10.3389/fpls.2016.01019. PMC 4940680. PMID 27462341. ^ D. V. Spracklen; B. Bonn; K. S. Carslaw (2008). "Boreal forests, aerosols and the impacts on clouds and climate" (PDF). Philosophical Transactions of the Royal Society A. 366 (1885): 4613–26. Bibcode:2008RSPTA.366.4613S. doi:10.1098/rsta.2008.0201. PMID 18826917.